One of the most endearing sleuths to come along in a while has to be Flavia de Luce, an 11-year-old aspiring chemist with a knack for solving murders. Flavia, the creation of author Alan Bradley, was first introduced in The Sweetness at the Bottom of the Pie and was soon followed by five follow-up mysteries. 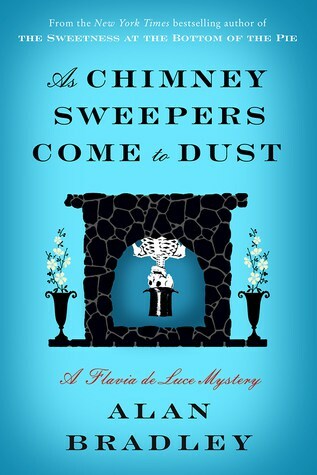 Now the seventh Flavia mystery has just been released—As Chimney Sweepers Come to Dust. Flavia, now 12 years old, has been “banished” (Flavia’s word) to boarding school at Miss Bodycote’s Female Academy, but her misery quickly turns to delight when she has a new murder to solve—that of a mummified body that falls out of a bedroom chimney. Flavia de Luce mysteries are available as books, audiobooks, and ebooks. As a special “behind the scenes” treat, the producer of the Flavia audiobooks, Books on Tape, has provided readers and listeners with a special video of the voice of Flavia, Jayne Entwhistle. Watch to find out why Jayne loves Flavia and hear an excerpt from As Chimney Sweepers Come to Dust!